The South Korean government said Thursday it will impose penalties on carmakers that cover up manufacturing defects and fine them for delayed recalls. 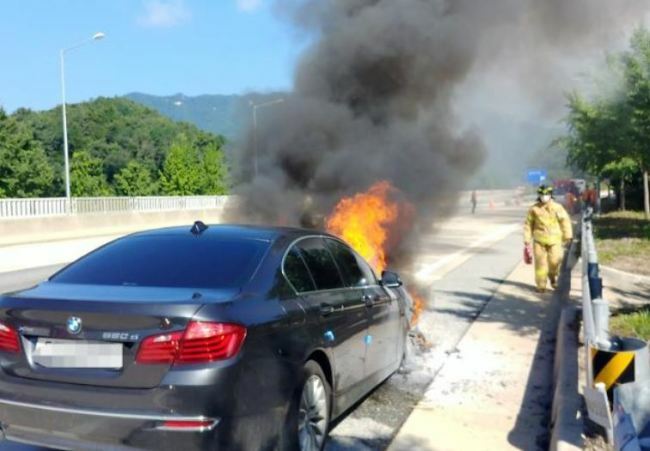 The move comes in the middle of BMW Korea's recall of 106,317 vehicles in South Korea to fix a faulty part following dozens of engine fires in its cars so far this year. "A series of fires in BMW vehicles has fueled safety concerns among local consumers. The government has come up with strengthened measures to keep carmakers from delaying recalls (for faulty parts in their vehicles) and to urge them to resolve problems in a timely manner (to avoid any related injuries or fatalities)," an official at the Ministry of Land, Infrastructure and Transport said in a joint statement with the Prime Minister's Office. Under the new proposals, the government will impose a penalty equivalent to 3 percent of an affected model's overall sales if it scales down or conceals defects in its models. And, in the case of delayed recalls, it will increase the ratio of fines to 3 percent of an affected model's sales from 1 percent at present, the statement said. The transport ministry said it believes the proposed penalty is enough to put pressure on carmakers and that lawmakers could strengthen penalties during the deliberation process. The proposals are subject to the National Assembly's approval later this year. Carmakers will be required to submit all necessary documents to the authorities and clarify what components need to be replaced or fixed once the government begins an investigation into a vehicle to see if it has manufacturing defects. In strengthened punitive damages, carmakers will be required to pay more than five times the cost that an owner incurred for a defective vehicle. This applies when carmakers don't take steps to resolve problems even after they notice manufacturing defects in their vehicles, the statement said. Still, analysts said the proposed measures are not strong enough, noting that the purpose of penalties and punitive damages is to ensure carmakers do their best to protect consumers by putting enormous burdens on manufacturers. "Penalties and fines will have an effect if they are raised in a way that poses a threat to manufacturers," said Choi Young-seok, a professor of smart automotive engineering at Sun Moon University. In recent months, BMW has been criticized for its belated response to the incidents involving fires in over 40 of its vehicles this year. The Bavarian carmaker began recalling vehicles with fire-prone exhaust gas recirculation on Aug. 20 and aims to complete it by December. The Bavarian carmaker has even been under suspicion that it may have downplayed the cause of engine fires to avoid massive recalls in a major export market. It blamed the EGR as the "root cause" of the recent fires.